Haq's Musings: Are Karachi Stocks Poised for Major Crash? 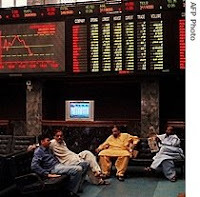 Karachi stock market is fearing the worst as the authorities contemplate removing an artificial floor of 9144 for KSE-100 imposed on August 27, 2008. Karachi stocks have remained unscathed through the meltdown of major stock market indices around the world in the last few weeks. This has happened in spite of the precipitous drop in Pakistan rupee and the widely feared default on sovereign debt by Pakistan. The reason why Karachi stocks have not suffered has nothing to do any "strong" fundamentals seen by astute investors. It is because of an artificial floor imposed on KSE-100 by the authorities. Fearing a complete meltdown of stock prices at Karachi Stock Exchange, Pakistan's Securities and Exchange Commission imposed a floor of 9144 for the market's benchmark KSE-100 index. The index closed at 9144 level on Wednesday, Aug 27, the day the KSE and SEC announced their decision to not allow the KSE-100 to trade below this arbitrary level. This extraordinary action, the first of its kind since the exchange opened its doors in 1948, came after investors pushed down the index to its lowest level in more than two years. Since this highly unusual action, the trading volume at Karachi has been extremely low. Daily trading volume dropped to a record low level last week to less than a million shares. As a precaution before the KSE-100 floor is removed and to soften the blow for investors, the government is offering a Rs. 50 billion fund to bail out the shareholders. The fund will likely be used to offer "put options" worth Rs 30 billion to foreign investors. Pakistani stock brokers like the idea but they want at least Rs. 15 billion to cover losses by their Pakistani clients, according to media reports. While Pakistan's Rs. 50 billion bailout package is laudable, it will be no more than a band-aid for a much more serious problem in Pakistan: Major loss of investor confidence. Unless the national leadership takes steps to get the economy on the right track and restore investor confidence, the rupee, the stock market and credit market and the whole financial system will continue to verge on collapse. Pakistan extended trading restrictions on its stock market for the third time in a month to prevent a further slide. ``Some time is still required for the implementation of market stabilization measures,'' Adnan Afridi, managing director of the Karachi Stock Exchange told reporters today. Shaukat Tarin, the Prime Minister's finance adviser will visit the exchange on Oct. 31, after which a decision about ending curbs will be taken, he said. The Karachi Stock Exchange's benchmark KSE 100 Index has lost more than one-third of its value this year. Board members met over the weekend to discuss extending the curb, which was scheduled to be lifted on Oct. 27. The board also discussed ways to prevent possible violence by angry investors. Indian economy had a set-back not because of financial contagion spreading from US, or because of the interdependent global trade system, but because of our own perfidious financial derivative called Participatory Notes [PNs] compounded by an anti-national agreement with Mauritius to permit even $ 1 paid-up companies incorporated in that country to invest in Indian stock markets and not be subject to capital gains tax. This was a “gift” from previous Finance Ministers, Yashwant Sinha and P. Chidambaram. The Finance Ministry’s PN is unprecedented in world financial history. It is a piece of paper issued by designated financial institutions abroad such as Fidelity Investments and Morgan Stanley, which paper does not carry any detail except the money worth, and can be purchased by anyone with cash even without disclosing to any regulatory authority his or her name and the source of the funds! That piece of paper was acceptable for transactions in the Indian stock market for buying and selling shares as also short selling. By a special order, the Finance Ministry under Chidambaram exempted the PNs from the purview of SEBI, RBI, Enforcement Directorate and CBI ! The SEBI headed then by Damodaran protested and repeatedly wrote to the Ministry to permit it as in any other stock market transactions to require reporting of the buyer and the seller as also the source of funds. The Tarapore Committee on Financial Reforms strongly condemned PNs and wanted it scrapped. The RBI Governor Reddy kept warning of dangers from PNs. All were ignored. Damodaran and Reddy were denied usual extensions of tenure. Their successors have fallen in line. Hence the perfidy continues without any accountability. Thus, billions of dollars of “hot”money entered into the Mumbai stock exchange, that was used for buying and selling shares with PNs almost like cash, in fact better because cash transactions of over Rs.10,000 have to be reported with details to the Income Tax Department. Moreover if it came via Mauritius, it did not have to pay capital gains tax. By September 2008, PNs accounted for 60 percent of the FII funds in the stock market. When the financial crisis was officially acknowledged in the US following the collapse of Fannie Mae and Freddie Mac, two government owned loan providers, followed by Lehman Brothers in September 2008, a liquidity crunch developed in US and later in Europe. Interest rates rose. Liquidity froze and funds were in demand. The PNs, which were “hot money” or Portfolio funds, just shipped out of India without any hindrance to the tune $60 billion in October 2008-January 2009 causing a stock market crash symbolized by the steep fall in the Sensex index. It is this that caused the financial crisis in India and not the US sub-prime loan defaults. Why was Mauritius Tax Treaty and PNs invented by the then Finance Ministers of India ? Because it was to assist corrupt politicians and business persons to earn on their loot parked in Swiss Banks, Isle of Man, Cayman Island, Macao etc.. Till PNs came into existence this loot was just stashed away in secret accounts and they were paying service charges to the banks for keeping it secretly ! Now these bandits and pirates could earn easily on their ill-gotten money by playing anonymously on the stock market, and through consequent capital gains without having to pay taxes that honest citizens have, thanks to the Mauritius Treaty. If the best time to buy, as the old business adage says, is when there is blood on the streets, then Pakistan’s commercial capital, Karachi, offers the ideal investment opportunity. For more than a decade, the sprawling seaport megalopolis of about 20 million people has been racked by political, militant and criminal violence that has taken thousands of lives. Yet, over the same period, the city stock market, which is also Pakistan’s main exchange, has posted spectacular results. Over the past 12 months alone, the Karachi Stock Exchange has surged more than 44 percent, placing it among the world’s top-performing stock markets in dollar terms this year, according to Bloomberg. That follows a decade of growth in which one dollar invested in an index fund of Pakistani stocks 10 years ago would have earned, on average, 26 percent every year, analysts say, in a period otherwise notable mostly for bad news. As the stock market rose, the Pakistani military leader Gen. Pervez Musharraf fell, Osama bin Laden was captured and Taliban violence spread from the northwest to cities across the country, including Karachi. Just as surprising, perhaps, Wall Street firms are driving the latest phase of the stock boom. Bad news can make for a good bargain, they say. The gloomy image of Pakistan obscures positive aspects of its economy that, investors say, make some companies an attractive bet. Beyond the headline news, much of the country is getting on with normal life. And with a population estimated at nearly 200 million people — a high proportion of them young — Pakistan offers a large, lucrative market for consumer goods, construction and financial services firms, which constitute the bulk of the Karachi stock market. The biggest publicly listed companies — like the multinational Nestlé, the Oil and Gas Development Company and Fauji Fertilizer, a military-run conglomerate — pay handsome dividends, which makes them attractive to foreign investors. And the recent election victory of Prime Minister Nawaz Sharif, a business tycoon, has injected confidence into the financial community, which had been wary of the previous government.